An Outline of Esoteric Science. Esoteric Science, the Wisdom Religion, embraces all that is good and true in the great religions of mankind, yet transcends them all. As far as can be expressed in words, it reflects Truth, insisting on the unity of the cosmic process. As we are of a like nature with the Cosmos, of one Essence, we are members of one family. This outline of the Wisdom teaching consists of extracts from the original literature with an illuminating commentary. We learn of the various levels of operation in the Cosmos and humanity; the personality, when unrestrained, tends to be entirely self-concemed, whilst the Individuality is rooted in the Divine Unity. As we become increasingly responsive to this Individuality, it exercises a unifying influence in our lives. A complete course in basic theosophy. Being a Clear Exposition, in the Form of Question and Answer, of the ETHICS, SCIENCE, AND PHILOSOPHY for the Study of which The Theosophical Society has been Founded. A philosophical and spiritual position exists which says that all we need to know or can want to know about the real meaning and nature of the universe or of ourselves, or about the origin and destiny of human life, has been known from the beginning of humanity. This wisdom has always been known and is now known deep down by all human beings. But the ancient wisdom can only be known consciously by those who are prepared for it and who look for it. It is a wisdom about the combined spiritual and material nature of humans and all beings, and about the evolution of consciousness as well as of life. It is about the spiritual side of atoms, planets and stars, about the unity of being and the interconnectedness of all true seekers on this and all other worlds and galaxies. This position is often called Theosophy. One modern presentation of this worldview is in the writings of Helena P. Blavatsky, including Isis Unveiled and The Secret Doctrine, and in the teaching and life of the Theosophical Society of which she was one founder in 1875. In the present book, Theosophy, I have tried to summarize some of the essentials of this teaching and way of life in simple and contempoary form. If you find ideas like these at all interesting, I hope you will give my book a try. Not only is this consise book a very good introduction to the life and work of Blavatsky, the founder of the Theosophical Society it presents some of the principle doctrines of the Theosophical Society with a degree of clarity that modern readers should appreciate. THEOSOPHY, WHATS IT ALL ABOUT? An elementary outline of principles. Revised edition. W.Q. Judge. First published 1893. Subjects covered include: Theosophy & the Masters; Body & Astral Body; Reincarnation; Karma; Psychic Phenomena & Spiritualism. 'Robert Crosbie was the Founder of the United Lodge of Theosophists and of the magazine 'Theosophy,' and was for many years a pupil of William Q. Judge. The Introduction to this 1937 book states, "The Ocean of Theosophy, written by Mr. Judge, was regarded by Mr. Crosbie as the perfect condensation of Helena Petrovna Blavatsky's great work, The Secret Doctrine, and therefore the best possible book to put in the hands of students [and thereby] the fundamental teachings of Theosophy. A portion of each session was devoted to questions and answers, which were preserved in stenographic records." This book of over 400 pages is a real compendium of wisdom. Consisting of both letters written to colleagues and fellow Theosophists and talks given at Theosophical meetings on many different subjects, “The Friendly Philosopher” reveals the kind and open-hearted wisdom of Robert Crosbie, the man responsible for the founding of the United Lodge of Theosophists. Over the years, this book has proven to be a tried and tested source of encouragement, advice, comfort, and inspiration for many pilgrims on the Path, all of whom are bound to meet the same problems, difficulties, and situations as one another. Contains 30 articles written by Shri B. P. Wadia during his anonymous editorship of The Theosophical Movement, a monthly magazine available since the 1930s. Sylvia Cranston has written a definitive biography of Madame Blavatsky, detailing her adventurous life and tracing the influence of her ideas after her death. The experience of one student is, on the whole, the experience of all. Details differ: some are made more instantly rich than others, for they have put forth a more vigorous effort, or they have a Karmic store which brings aid. For those who need assistance on the Path, these short letters, by a co-founder of the Society, give moral uplift and practical inspiration in living the life. One of the best biographies, written by a man who knew and worked with her, this is a frank account of her work on behalf of humanity, and the obstacles against which she fought. A scholarly compilation, an account of the knowledge and powers of Eastern Occultists and examples of the attainments in this field of H.P. Blavatsky. ECHOES OF THE ORIENT 3 vols. Reprints of the writings of W.Q. Judge for his magazine The Path, etc., with answers to many questions. W.Q.J. was a direct pupil of one of the Masters. A summary of the teachings of Mme Blavatsky and her Masters concerning the world of invisible substances, forces and entities behind manifest existence, and giving an account of the after-death states. Manuals of meditation have flooded the market, some good, others less so. This simple text, written by the founder of the Buddhist Society gives a one year course in spiritual and moral thinking, without the gimmicks and 'instant success' claims of other volumes. A story of travels, adventures and marvellous happenings. REMINISCENCES OF H.P.B. AND THE S.D. Some letters and comments describing the life of H.P. Blavatsky when writing The Secret Doctrine. A modern biography competently defending H.P.B. against her detractors. Contains a short summary of the contents of The Secret Doctrine. An early summary of theosophical principles by a pupil of H.P. Blavatsky. First published in 1930. 365 pages. 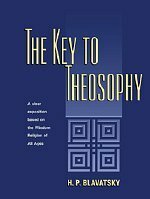 A popular outline of theosophical teachings. First published 1950. 125 pages. Hardback. Fine essays on modern themes. A short Paper.